Diamonds are a multi-billion dollar business involving some of the world’s largest mining companies, a million and a half artisanal diggers, more than a million cutters and polishers and a huge retail jewellery sector. But behind the sparkle of the diamond lies a murkier story, in which rebel armies in Angola, Sierra Leone and the Congo turned to diamonds to finance their wars. Completely unregulated, so-called blood diamonds became the perfect tool for money laundering, tax evasion, drug-running and weapons-trafficking. Diamonds brings together for the first time all aspects of the diamond industry. In it, Ian Smillie, former UN Security Council investigator and leading figure in the blood diamonds campaign, offers a comprehensive analysis of the history and structure of today’s diamond trade, the struggle for effective regulation and the challenges ahead. There is, he argues, greater diversification and competition than ever before, but thanks to the success of the Kimberley Process, this coveted and prestigious gem now represents a fragile but renewed opportunity for development in some of the world’s poorest nations. This part of the diamond story has rarely been told. Ian Smillie currently chairs the Board of the Diamond Development Initiative, a non-governmental organization working to improve the condition of Africa’s 1.5 million artisanal diamond diggers. He has written extensively on the issue of conflict diamonds and was directly involved in the negotiations leading to the creation of the Kimberley Process Certification Scheme. "Fifteen years ago Ian Smillie looked at a diamond and saw blood, and he rallied civil society and the diamond industry to address the blood diamond challenge. In Diamonds he cuts his way into the myriad facets of the diamond story  from geology, to mythology, to development and more. Diamonds is information-packed and inspirational, as is Smillie." "Ian Smillie examines the messy diamond trade from the soil upward in this valuable book. He knows far more about diamonds than any dealer, and he cuts through decades of haze to tell you the truth." 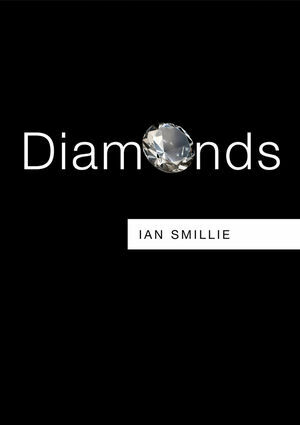 "Ian Smillie has produced a remarkably concise yet insightful look into the diamond industry  science, commerce, conflict, activism, Kimberley Process regulation and the ongoing challenge of international development  based on his years of first-hand experience on the front lines." "The author's eloquent and accessible style prevents the material from seeming dry, and his discussions of the potential for socioeconomic benefits in poorer countries and the complex political, social, and economic issues surrounding blood diamonds are particularly insightful. This informative primer will be highly valuable to readers interested in geology and earth sciences, business and economics, and history and sustainability studies." "Ian Smillie comes across very effectively as a committed and experienced activist with relevant expertise. For those interested in the long arc of Africas so-called blood diamond issue, this book provides that story, explaining how diamonds became an almost ideal vehicle for money laundering and the archetypal case for how governments and independent militias have used natural resources to finance war and violent repression."